I really wish I could remember what review I read that made me pick Unearthly up from the library, because I owe them a debt of gratitude. This book was pure magic. I loved it so much that I could just go on and on about it. Unearthly is one of those rare books where you automatically feel like you are part of the world being created and have known the characters forever. Clara Gardner and her family aren't like everyone else. They have a bit of angel blood in them. It makes them able to do things faster and better then everyone else and more importantly, they have a Purpose that they are suppose to fulfill. Clara isn't sure what her Purpose will be~until she starts having these dreams of a boy her age standing in the middle of a forest fire needing help. When the dreams start occurring when she's awake, her mom knows that her Purpose is to save that boy from the fire that will happen sooner rather then later. The dreams/visions lead Clara and her family to move to Jackson Hole, Wyoming so that Clara can save the boy from the fire. I have to admit, that when this happened, I questioned her mom a bit on this move. I mean you are seriously going to uproot your entire family for one girls vision?? One of the most frustrating parts of this book-for both Clara and I was the fact that her mom is stingy with handing out angel information. I just didn't understand why her mom would help her with some of the angel transition stuff like flying, but not other stuff like what her own Purpose was and what Clara could expect to happen to her during own Purpose. (There's a reason for this, but it's not given until the end of the book) One of the things that I loved about Clara and her brother Jeffery was that while they tried their best not to let their angel blood be obvious to everyone when they move to Wyoming, all of the things they've tried so hard to hide start slowly coming out into the open. Clara becomes best friends with Wendy and Angela-two girls who couldn't be more different from each other, but both sense something is up with Clara and her brother...especially when her brother beats out the whole wrestling team to join it after tryouts for the year are already over and every time Clara tries a new sport with Wendy she automatically gets it right on the first time, which makes her twin brother Tucker weary of her. 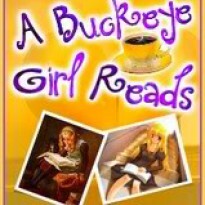 While there are lots of things Clara is good at one there is one thing that Clara doesn't get right-she just can't fit in at her new school, and the guy she's suppose to protect in her Purpose is Christian Prescott, aka Mr. Popular. He also happens to be dating the most popular girl in school who happens to dislike Clara with a passion. One of the things that endeared me to Clara was that she kept trying so hard to make Christian notice her or do things that he liked so she could fulfill her Purpose, and it all totally backfires. I think this is what made Clara one of my favorite all time YA heroines~because she tries so hard at being the good daughter, good angel and everything just totally backfires on her. She's just completely likable and adorable in her quest to figure out everything on her own. The secondary characters and layers in this book are wonderful. I really liked Christian-it seems like he's just so oblivious to everything that Clara is trying to do to get closer to him. He's nice, and while I wanted cheer for them to get together, after meeting Tucker, Wendy's twin brother I just couldn't do it. Tucker won me over immediately when he called Clara Carrots-which totally reminded me of Gilbert in Anne of Green Gables. I thought it was interesting how that book was never mentioned-but I picked up on the word immediately and what Tucker meant by it. (That makes me old, doesn't it?) The friendship of Clara and Tucker was enjoyable to watch. (I had so many sigh moments with Tucker that it made me feel like a cougar.) I loved the banter back and forth and how for once, it was age appropriate. (I think in so many YA books on the market today that the romance is way to mature for the age group reading it, but then again it could just be my old age showing up.) Angela and Wendy her two best friends are great because they are so totally different from each other, and I liked how they each brought out different sides to Clara. I also really liked how Clara's family wasn't forgotten in the storyline. While her mom and brother do disappear for a bit in the book, they aren't written out completely and are around to help just a little bit. There are a lot of different layers to the book but the most obvious ones being good vs evil and honesty vs. dishonesty and how far you can go before one turns into the other. (I still think Tucker and Wendy and Clara's mom are hiding something more then what we've seen in this book, I'm just not sure what yet.) 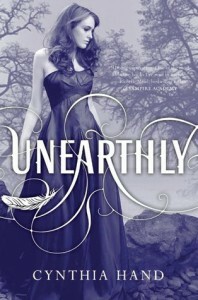 Unearthly is one of those books that just sticks with you long after you've finished reading it. I've never been a big fan of the angel themed books that are so popular right now, but I am so glad that I made an exception for this book. In case you couldn't tell I loved it to pieces. It's a treat for all ages. I don't have a star rating, but it's totally 5 star worthy. I can't wait for the second book in the series to come out in October!